The Viridian Resort is located in downtown Patong, so it is surrounded with shopping places like the nearby Jungceylon Department Store. 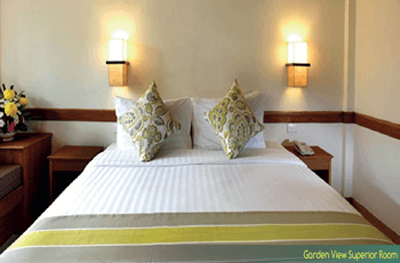 It is a short walking distance to Patong Beach and Soi Bangla's night street entertainment. The resort features beautiful landscaping and tropical gardens all around. A trendy new hotel with modern Sino-Portuguese theme near Patong Beach in Phuket. The KEE Resort & Spa is a Thai-owned avant garde tropical retreat with a vast lagoon-like swimming pool and contemporary Sino-Portuguese theme in the heart of Thailand's most popular tourist destination. Comprising of 244 guest rooms, a spa, and several dining outlets, The KEE features a wide range of high-tech communication facilities and automated services of international standards to ensure convenience for holiday makers and travelling professionals. A designer hotel comprising of 258 Guest & Suite Rooms overlooking the skyscrapers of Patong Bay. The hotel is well located in the heart of Patong, close to the Jungceylon Shopping Center, the walking street "Bangla Road", and a few minutes walk to the beach.